Just round the corner from the Estuary and walking distance to the surf beach, this is a great place for a holiday. It is close to the boat ramp and all amenities, and has lots of room for tents, boats etcetera as we also have an empty block of land next door. The bach is in good condition with one double bed room and a second with two bunk beds (children capable) and a double fold out sofabed. A large deck links the bach to a cabin with a double bed and its own ensuite (newly established in December 2011). The deck has an outdoor seating and bbq area, and has an outside shower. There is an outside shed with a washing machine and drinks fridge, plus storage if required. This is a traditional family bach which is quite warm in the winter months. We don't have a TV, but have lots of games, puzzles, stereo etc. Our approach to renting is very open. There is usually beer and wine in the fridge so that you can have a cold drink when you arrive, and restock for us. If you use something of ours, we trust that you will replace it. We have found that this approach is easier for all concerned and ask that you respect it. Two night minimum stay during the year and one week minimum over the Christmas period. Unfortunately I cannot enable auto booking because bookabach don’t support minimum stays. I will try to respond promptly to your enquiry. Note that HomeAway are more expensive to operate for a bach. 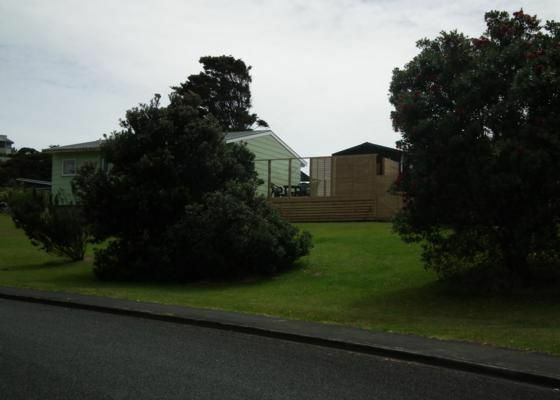 If you want, we also list on Holiday Homes as Mangawhai Magic. Great location and lovely bach. Would recommend. We had such a great stay in this bach. We had such a great stay in this bach. Huge deck, massive lawn area to play around with the kids and very close to the Estuary. Basic but perfect for a bach! Would definitely stay here again. Great stay! Loved the bach location. Pretty great location (close to our friends who we wanted to be near). Pretty great location (close to our friends who we wanted to be near). Easy walk to estuary and central to get to beach or town. The bach has all the basic necessities you need. It's a typical bach so you can relax if you have sand on your feet or a beer on the deck. Great location. Bach needed a clean when we arrived but other than that, great place to relax and unwind.